Martin Mewies is a new kid on the block in the speedway art world. 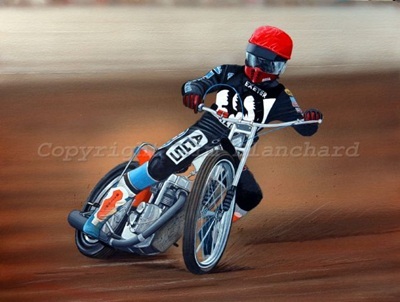 Here's a look at his painting of Leigh Adams, which he may be able to make available if there is a demand for prints. Dave Green looks at some of the fallout from last weekend's BSPA conference. The Friends of Speedway group is now a well-established part of the speedway scene, but it seems that there are still some who haven't joined! Here's some detail on the history, achievements and purpose of the group. Tony Blake is looking for info on Bill Thatcher and Bob McFarlane - Can You Help? Geoff Theobald believes that Hackney's Magnificent Seven was the best theme tune in the sport, but would like to know about the music used at other tracks - Can You Help? 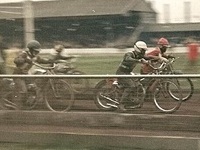 Geoff has also pointed out an interesting Hackney Speedway video on the Pathe News website - you can see it here. "Good story, very intensive. I followed Gary many times on his continental tours as Editor from Bahnsport AKTUELL, Germany Magazin, many times we travelled together to meetings (Linz we had a car accident). I see him last time in the pits of the LA Final 82, he tipped me on the shoulder ''Follow me'' and show me a badges from FBI an his jacket. Later he told me, he was married with a daughter from an embassador (Puerto Rico? ), and Briggo told me, as you wrote, he has problems with the police, as they sold bottles from a lorry, to help against cancer, but it was nothing worth....that's the last." "Yes let's hope Len Silver receives a knighthood for services to cycle speedway & to motorcycle speedway. I would also like to mention Ronnie Genz's name for a knighthood for his services to cycle speedway & motorcycle speedway. What say all you?" "Ian Hawkins is correct in pointing out that it should have been Chris Julian and not Chris Julians in the team photo. I made the mistake of using the spelling that appeared in the programme of that meeting. On further examination of the Glasgow programmes of 1964 I noticed that for the first meeting, Chris's name was given as both Julians and then Julian. I hope that other fans will be encouraged to share their snapshots of yesteryear on Speedway Plus." "That got the nostalgia nodes working. It's amazing how a couple of well chosen photos can make you feel as if you are still there. I was a 'pusher' at White City' (back in the day when it was not an arrestable offence). I had to start at the bottom (Y/B helmet) so usually only got to push the opposition second strings. Still I got in for free, got a free programme and got a couple of 'bob' for my troubles. All this and I got to rub shoulders with my heroes and pick up the latest inside stories. Let's have a few more from your collection, Peter." We will have more of Peter's snapshots in next week's update. We'd be delighted to receive similar contributions from others also. Thanks to Arnie Gibbons for these pictures of this Danish 80cc track. It's the junior track associated with the Fredericia club, but unusually is located a couple of miles away from the main circuit. Details of a new initiative to get the Long Eaton Invaders back on track for the first time in more than a decade. 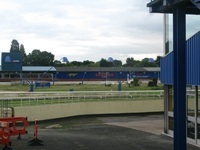 Chris Wallett has provided these snaps taken at Hall Green greyhound track in Birmingham, one of the many former speedway circuits in the city. The 39th edition of the Voice, produced by Friends of Speedway, whose profits all go towards sponsoring Under-15's speedway, is now available. This edition has a new design front cover and features an extraordinary account of the intricacies of the immigration rules affecting the eligibility of prospective riders from outside the European Union, plus news of pensioners Briggo and Olle Nygren's epic rides. Also a profile of the legendary Wilbur Lamoreaux and a suggestion that a European Elite league may be the way to go for top flight British speedway, plus a host of other interesting old and new speedway articles. Stuart Towner at 117 Church Lane, Chessington, Surrey KT9 2DP. Further to our recent track pix of Stoke, there are further pictures of the track available on the Potters Power website. "To Cradley Fan Matt,, You can have a skid!!! Scunthorpe have the gear, Wayne Carter runs a school every Sat and Sun,,. We have attended many times, everything provided, helmets, boots, clothing etc,,, Just sign on, pay up, and enjoy, very relaxed and good fun.. Wear something warm!!! It's always windy.."
"When you look at these pictures of the riders and their gear the riders of today don't know how lucky they have it. " "The picture with Charlie Monk smiling must be worth a fortune!! Charlie was one my fav tiggers, great racer but always so dour, very few monarchs went unbeaten when Charlie came to Meadowbank. Thank you for the photos and memories. " "Keep it up Peter. The Tigers are a part of our lives and we meet a lot of good people, and your images are part of the history of the team that we love." "Excellent photos which bring back happy memories of White City and epic trips through there on a 50CC Honda (pre M8) and regularly getting lost on the way back, but one minor question - was his name not Chris Julian (no S)"
"Thanx so much for sharing these photos - brought back a lot of memories - wish we could all go back to those days!" Thanks for sharing your excellent photos. It's true what you say about Charlie Monk. As a child he was without a doubt the hardest rider to get to sign an autograph. However I did manage this impossible task a couple of times!." "Brilliant, I think there must be 100's of snapshots out there taken by Speedway Fans over the years. These photos taken by the ordinary guy and gels of their favourite team or riders show the true love of the sport. These photos may not have been taken professonally but they do convey the atmosphere from the spectator's side of the fence and help conjoure up many memories for the people who took them. Well done Peter, great photo's. I'm off now to search my old photo albums to see if I've got any photo's worth putting on the site. I think I've got one or two." This excellent response to the first of Peter's articles clearly demonstrates there's an appetite for similar pieces. We'd be delighted to hear from anyone with speedway snapshots they'd like to share. Tracy Holmes pays tribute to the former Wimbledon Don and Newcastle Diamond. 'Stape' suffered a heart attack a couple of years ago, but is still enjoying life in New Zealand. Brian Longman has sent us some updated pictures of Loomer Road that he took during the 2010 season. Speedway artist Jim Blanchard's latest work is this magnificent painting of Scott Autrey. Sadly no prints are available for sale of this particular work, but he's got many equally good pictures available from his website at www.jbsportsimages.co.uk. These include limited edition prints of Chris Harris, Hans Andersen and Tai Woffinden signed by the riders. Ronnie Hynd has a picture of a rider called M.Brailsford and wants to know who he rode for - Can You Help? John Hyam is researching the career of Ernie Roccio - Can You Help? Peter Heinzl is unsure about publication dates for the Five-One magazine - Can You Help? Jeff Scott has put together a set of pictures from his travels in 2010. You can see 'Shale Snapshots 2010' on his website. "I should beware before going along. The date may be wrong. This is what I have found on a website: no time is given. LEWISHAM LOCAL HISTORY SOCIETY - Friday 26th November 2010 - The New Cross Speedway - Norman Jacobs. 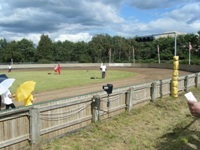 The New Cross Speedway was next to Millwall's football ground. The speaker has recently had a book published on the subject, Out of the Frying Pan." "I think the reason given for the demolition of the Chieftan was 'asbestos' at the time, but who really knows?" "Andy, the Chieftain was demolished before it fell down anyway. It had an asbestos roof full of holes so the Department Of Health And Safety decided it had to go. It had been closed down for years anyway, but in it's day, made for great viewing for the dog racing. 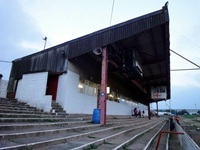 I can never recollect it being open for speedway, although in the Aces first few seasons there, fans could stand on the terraces in front of it." "Although these photographs were taken a couple of years after Hackney Speedway closed this is pretty much how I will always remember the stadium from my regular Friday night visits between 1976 - 1991. The first photo shows the back straight stand (big enough to be a main stand at many tracks) and the perimeter barrier. To get the closest viewing position it was possible to get underneath the handrail and lever yourself up to sit on the rail and place your programme board on the mesh fencing. The second photo shows the main entrance turnstiles in Waterden Road, there was a second entrance at the north of the stadium near the tote board. The yellow door was used as a separate entrance for season ticket holders. The third photo shows the main grandstand and in the middle is the referee�s box. The grandstand had a canteen and two bars in the enclosed section, and an open terracing with seating and a track shop next to the pits. There were also track shops on bends 1 and 2 plus a large wooden supporters club kiosk on bend 1. The fourth photo shows the Vic Harding Lounge on bend 4, this was used as a social area for riders, track staff and supporters after the racing ended. Bends 3 and 4 were mainly grassed banking with trees and were rarely used by spectators. Thanks to Mark for taking these and Steve for making them available to this website. " "Nice to hear Aage is still involved with speedway. 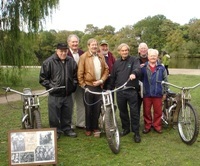 He was as near a saviour to Ipswich Speedway in 1957 as any rider was. I remember hearing that he had shattered the track record by a full second in practise when he first signed. Already qualified for the World Final that year, he was the first Ipswich representative on the hallowed Wembley shale. " Peter Colvin contributed a series of photographs to the Glasgow programme this season. Many of the pictures were taken by him and a few others were professional shots he's acquired over the years. We're delighted to feature some of them here on the site - starting with this selection from the White City track in the sixties. We'd be delighted to hear from anybody else who has pictures and memories they'd like to share in a similar style. 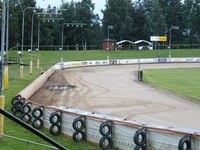 Thanks to Andy Higgs for these pictures from Kumla in Sweden - the home of the Indians. Stuart Towner from the Friends of Speedway organisation reports from the recent gathering at the old California Poppies track. Peter Jones is looking for an Ivan Mauger Fan Club badge - Can You Help? Reported last week in the Los Angles Times, a real estate management firm will buy the Orange County Fairgrounds for $100 million as part of an effort to sell off state-owned properties to address California's budget woes, officials said Wednesday (last) prompting a state lawmaker to announce plans to stop the sale. The Costa Mesa speedway track is located on the Orange County fairgrounds. Facilities Management West would make an initial $20 million payment for the 150-acre Orange County property and pay off the rest over 35 years, the Department of General Services said. Democratic Assemblyman Jose Solaria, whose district includes Costa Mesa, said in a statement after the sale was announced that he believes the fairgrounds should remain under public ownership and would introduce legislation in December seeking to block the transaction. "I expect strong bipartisan support for the bill," he said. "And come January, we will have a new governor (not before time in my opinion) that will be open to hearing our county's interests." Local politicians and residents have raised staunch opposition to selling the property, which has hosted the annual Orange County Fair since 1949. I'm hoping local Costa Mesa officials will be able to block this sale, however California continues to be gripped by continuing economic woes. "The proposal to ditch the Track Pix section is scandalous. It's one of my favourite bits of an excellent web site and to stop doing it would be a real shame. To say that all tracks look the same is akin to proposing to stop the publication of photos of people on account that they all have a head, arms and legs. A daft idea - keep the Track Pix." "I've never been to Kirky Lane but lost count of the number of times I was at Hyde Rd and I'll always think of it as "Belle Vue", especially when I think of end of season BLRC's there back in the late 60's/early 70's. What's happened to all the atmospheric tracks we had back then such as Hyde Rd, Wembley, and the rest, compared to the sparsely filled, antiseptic type stadia we see now?" "Cradley deserves speedway, speedway deserves Cradley - they will be back!" "Remember going to Love St quite a bit in those days even although I was only 5. Famously of course, Coatbridge Tigers never lost to the Lions!!" "I must have been at Rayleigh at the same time as Alan (see his feedback in this section). I too remember Peter's strange handlebars and I think he still rode a JAP when the others were on to Jawas. I think Alan, it was 1973 that he joined he Rockets as I still have several programmes from Rayleigh meetings that year. Geoff Maloney, Terry Stone, Brian Foote....Saturdays at 8pm at the Weir....yes those were days to remember..!!" "The Pink Lady Hudson Terraplane. Wasn't it driven by Freddie 'The Mad Parson' Parsons who lived near the stadium? He later became a quite readable author and lecturer, as well as training dogs for the Metropolitan Police." "I used to go to New Cross Speedway when I was at school as I lived in Peckham. I loved it especially the smell of Castrol petrol. As I got older I started to go to Wimbledon, not to watch Speedway but Stock car racing and have been a spectator ever since.But I will never forget the speedway at New Cross, the thrill and excitement will always stay with me. 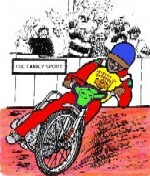 On the 27 November 2010 at the Methodist Church Hall Albion Way Lewisham SE13 at 7,30 is a New Cross Speedway Night open to Speedway enthusiasts, I will be there." "Now there is a good campaign, Get our Len (Silver)a knighthood! After all the pleasure he has given over the years (now from a West Ham Fan, thats saying something!) he should certainly get at least an OBE."